Should all children learn to play musical instruments? 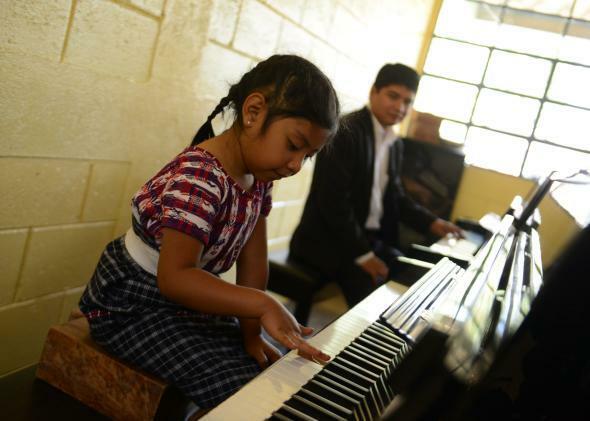 A girl gets piano lessons in San Juan Sacatépequez, Guatemala, in 2013. The benefits of starting your child down the path to learning a musical instrument are easy for parents to fantasize about but hard to quantify. Bear in mind that I’m talking about the actual nuts-and-bolts competencies of learning how to read music, play scales, improvise, and eventually play Carnegie Hall. When we start our kids off in piano lessons, or violin lessons, or [insert your fantasy instrument of choice] lessons, it’s my feeling that we need to be careful not to make the mistake of doing the dreaming for them. Some parents have it in their heads that forcing kids to practice rigorously will make them disciplined, that learning about music theory will make them smarter and more analytical in general, or that they need to be able to check “knows piano” off on their lists of “stuff my kids can do to turn them into well-rounded adults.” My best advice here—and this is sort of my mission statement as a parent—is don’t ever force them to do what they aren’t passionate about. Offer options, give them the chance to figure out what’s interesting to them, but don’t force. I’ll offer up my own childhood experience as an example of how enrolling a kid in music lessons under the wrong circumstances can have exactly the opposite effect of what the parent wants. My mom is a pretty talented pianist. She reads music very well and loves to play Chopin and various other classical artists. One of my earliest memories involves sitting under her piano bench while she played. It gave her a lot of joy and a lot of personal pride, I think. I trust that she naturally wanted those things for me when she enrolled me in piano lessons when I was about 7 years old. I hated them. I was scared of my teacher. I hated practicing. I hated the songs I was being forced to learn. I hated reading music. I picked up the basics easily enough, but I just never got to the point in my training where I could do it without thinking way too hard about it. I was a young kid, and there were other things I wanted to do instead. It just didn’t interest me, and no amount of begging and pleading on my mother’s part could get me to enjoy practicing. One thing in particular that she used to say as she was begging me to practice was, “One day, when you’re older, you will cherish the ability to sit down and play.” Nevertheless, after a couple years of once-a-week torture, she finally allowed me to quit. Years went by. I switched schools when I was 11 years old, got a new best friend, and got interested in music. This was a critical turning point. Allow me to repeat: I got interested in music. My best friend loved the band Bush and lots of other alternative bands of the ‘90s, and listening to them unlocked a whole new sonic world for me. I fell in love, fell completely and totally in love, with rock music. My friend taught me the form for a power chord on her acoustic guitar. If you know how to play a power chord, you can play or at least convincingly fake pretty much every single rock song in the world. It was like someone had given me my first hit of a powerful opiate. I spent hours practicing in my room. Hours sounding out my favorite songs. More hours playing along with those songs in front of my mirror, pretending I was Scott Weiland, Dolores O’Riordan, Chris Cornell, or my personal favorite Louise Post (of Veruca Salt). I unlocked a talent within myself that had gone obscenely undiscovered and undeveloped when I was a young child banging my head against a piano keyboard, trying and failing to read a piece of music—I could play the guitar by ear. I just hadn’t had the time to figure that out because my mom was trying so hard to get me to do something that did not come naturally to me and that I had no desire to do. The lesson here is don’t force. Your kids will attract the hobbies and skills that are interesting to them, at the right time, and it’s your job as a parent to nurture those interests, whatever they may be. Do not spend hours making your kid play violin until her fingers bleed and she hates you only to discover that she could have been spending that time doing what she really loved, like gymnastics or playing the drums or painting. I’m a music therapist by trade these days, and it’s worth noting that I help my clients use music to work through their issues and improve their overall quality of life as they cope with lots of challenging situations and disorders. The most important thing I want to stress about that is that nobody needs to have any formal knowledge about any musical instruments at all to have a positive, successful experience playing one. My kids are growing up in the presence of just about every instrument under the sun, and they are encouraged to explore them, to bang around on them, to have a good time, to pretend, to feel good. Maybe they’ll be interested in learning how to play one, or maybe they won’t. Either is fine. I will say one more thing: My mom was right. Now that I’m technically a grown-up, I do cherish the ability to sit down and play. Just not the damn piano. Parenting: Should people who are not parents offer parenting advice? Learning to Play Musical Instruments: What are the main reasons people drop out of piano lessons? Music: What is the best musical instrument and why?